A few weeks ago, Jeremiah and I decided to make shrimp tacos. I found a recipe that included a slaw complete with red cabbage. Unfortunately we didn’t need very much of it so we went searching for recipes to make with the rest of it. I told Jeremiah that the Pioneer Woman had a smoothie recipe I’d tried before and it wasn’t bad. I’m not sure Jeremiah believed me. Red cabbage is really healthy and their aren’t a lot of recipes out there to make with it. We added it to Jeremiah’s green beans with bacon. It was ok but we didn’t like it as well as when he usually makes it with bacon, shallots, and garlic. So I made the smoothie for him. It’s super healthy and fills you up until lunch. Make it yourself and see what you think. Blend together and serve. Makes four cups. Nutritional Information (Based on a two cup serving): 524 calories, 2 g. fat, 5 mg. cholesterol, 163 mg. sodium, 988 mg. potassium, 106 g. carbs, 13 g. fiber, 83 g. sugar, 28 g. protein, 30% Vitamin A, 145% Vitamin C, 78% calcium, and 11% iron. You could probably use regular yogurt but it will decrease the protein in this recipe. You could probably use berry flavored yogurt and decrease berry content. 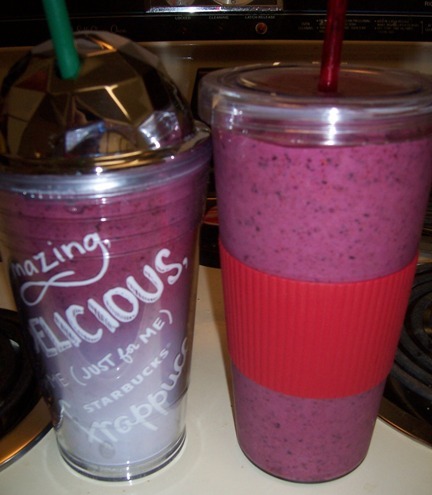 I used frozen berries and banana. I used lite cranberry juice. The original recipe also suggest grape juice.